Here we have another game by the ultra-prolific designer Reiner Knizia: Kingdoms. As with most of Knizia’s games, the rules are short, it’s quick to play, and it’s pretty abstract in style; and as with quite a few of them it is more than a bit mathematical. Concentration… Where to put this tile amongst all those blue castles?! The game involves playing tiles onto a grid, and those tiles have pretty pictures along with, in most cases, a number, either positive or negative. You also place cute, coloured plastic castles onto the board, those castles having between one and four towers on them. Then, at the end of the round, you total up the number of points on the tiles in each row or column, multiply by the number of castle towers in your colour in that row or column, adjust for the effects of a few special tiles, and that’s the amount of gold you win (or sometimes lose). To a lot of people that is going to sound like about as much fun as having your ears straightened, but it’s the sort of thing that I love, and with Miss B’s current obsession with doing maths (we have to do sums on the walk into school in the morning), I figured this could be a good one to try out. The fact that the current edition of the game is beautifully presented (as is usual for Fantasy Flight Games) doesn’t hurt either. Miss B absorbed the rules almost instantly and within a few turns she was talking about her options and which would be her best move. I needed to point out some of the less obvious options to her, like when a tile placement would harm her score but do a lot worse to me, but very little hand-holding was required here. Even at the points when I put a castle somewhere she wanted to go or placed a hazard (negative points) tile to affect her castles, there was a quick “Grr!” from her and she went right on to do something mean back to me. This is all good. So I think we have found another winner here. 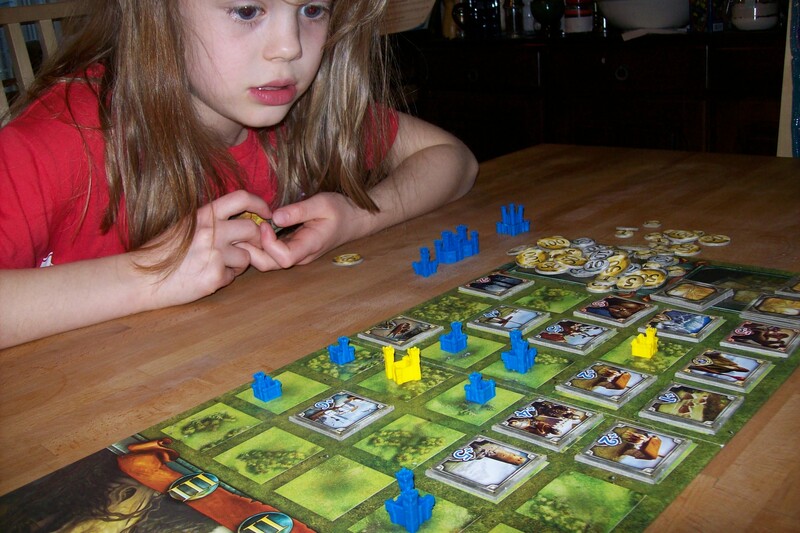 We both like the game (and actually, I think we may be able to persuade S to try this one!) and Miss B seems to be up for playing it some more. I think this may become a valuable addition to the roster. The game: Kingdoms (Fantasy Flight Games), 2 to 4 players aged 14+ (just one of those product testing dodges — there is no way you need to be 14 to play this!). Rather pleasantly, we got sent a free copy of a game called Plyt for us to check out. Miss B was excited about the prospect as it is a game about maths, something she enjoys at school, and the last maths based game we tried out (City of Zombies) went down very well. It’s a bit unfair to use flash photography when someone is actually thinking, so here is Miss B pretending to think. You may also note that she has almost won and I have almost started. Unlike City of Zombies, Plyt is a traditional competitive game, where everyone is trying to be the first to move their pawn around a spiral track to the winner’s space in the middle. On your turn you roll a bunch of twelve-sided dice and have the time provided by a 30-second sand timer to multiply the numbers on the dice. If you do it correctly in the time (you’ll probably need a calculator for checking — luckily Miss B has one in the shape of a frog which she relished using), you move forward a number of spaces equal to the number on the differently coloured die. If this moves you onto a space with a Plyt logo on it, you draw a “chance” card, which may be to the advantage or disadvantage of yourself or an opponent. To be frank, I was a little disappointed when I opened the box and seeing it was nothing cleverer than rolling dice and doing sums, with no chrome other than the unimaginatively named “chance” cards. Even the rules to set up balance between players are presented as optional rules that you should negotiate before you start. This is clearly not a game created by someone embedded in the modern gaming hobby. But it works. Make some reasonably intelligent choices with the balancing rules and go for it, and we at least had a good time with the game. 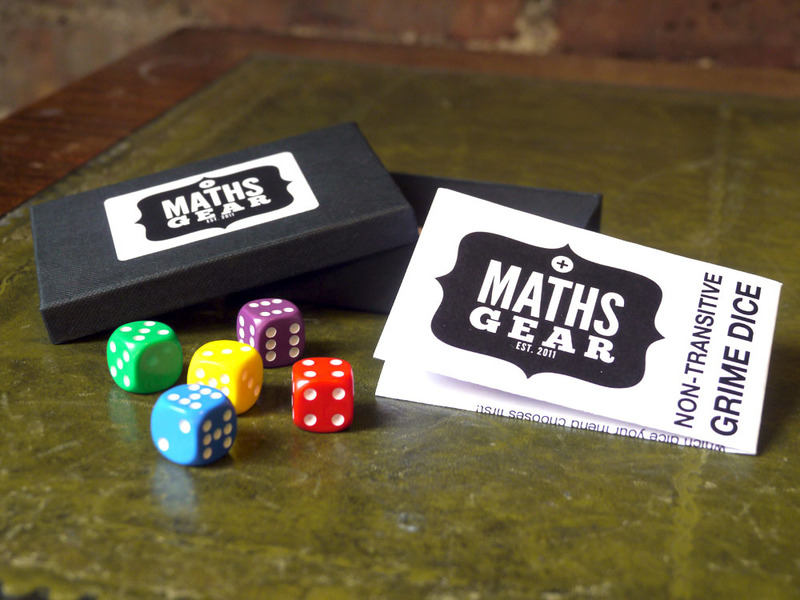 Miss B was rolling two dice each time, which meant she got most of the calculations right but had trouble with some of the times-tableses, while I was rolling four dice and revealing that my mental arithmetic skills could seriously do with improving. I got beaten quite spectacularly. And then the game got a real thumbs up from Miss B: she wanted to play again, suggesting that I might like to use fewer dice to make it easier for myself (stubbornly, I refused). She beat me a second time (though it was much closer) and asked for a third game. It was, however, time for dinner, so we had to stop there. Incidentally, I’d like to give kudos for the excellent decision to provide a little dish for rolling dice into. This makes things so much easier and almost avoids having dice landing on the floor or knocking pieces off the floor. So, while I am not overwhelmed by Plyt as a game, it has some things to recommend it, and Miss B is extremely keen. So it’s certainly going to get played again. 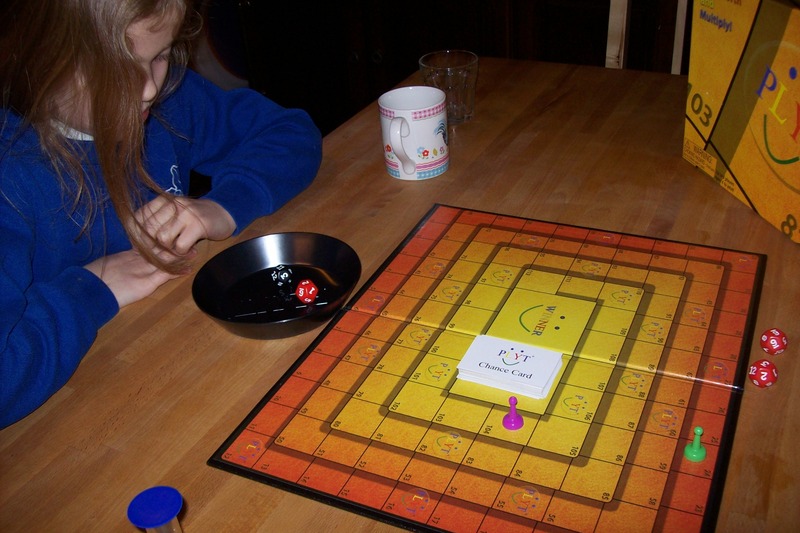 The game: Plyt (Talkplaces), 2 to 6 players aged 4+. It’s lucky you’ve got the skate board! I mentioned City of Zombies in a post a week or so back as a Kickstarter project that I liked the look of. Well, there’s good news and there’s bad news. I don’t often get to be in these pictures, but here we are, trying to save our last group of survivors. I’ll start with the bad. After rather underwhelming support on Kickstarter Matt, the creator of the game, has decided to cancel the funding as it was looking like it would fall far short of its goal. As far as I can make out, and this is purely my guesswork, the problem was partly to do with not getting a publicity machine mobilised in time (a common failing) and partly that the comparatively small scale of the project meant a price per unit that US-based potential backers (a sizeable part of the potential market) didn’t like the look of, particularly when considering international shipping (personally, I think it looks pretty reasonable from where I sit!). The good news, however, is very good. Matt has figured out a way to go ahead with the project anyway and fund it himself. He has been schmoozing with assorted people and keeps on pushing, so the game will be seeing the light of day, and this looks like it will be in the next month or so as production is under way. Anyway, Miss B and I met up with Matt at the wonderful Thirsty Meeples boardgame café in Oxford, where he has been running fairly regular demos, and we got to try out the game for ourselves. So, how does the game work? 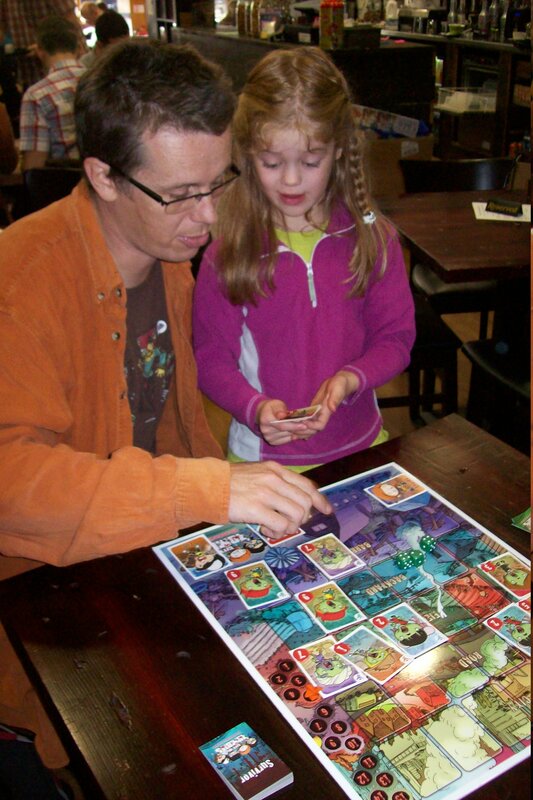 Well, basically this is a cooperative game where cards representing the cutest zombies imaginable (a set of cards with less cute artwork is also provided as an option) appear at one end of the board and then relentlessly bear down on your barricades at the other until either they completely overrun you or a set number of turns elapse and you are rescued. You get rid of zombies by rolling three dice and doing bits of arithmetic to combine the numbers on the dice to match numbers on the zombie cards. Yes, it’s actually a maths game and a lot of the sales pitch is towards schools. In fact, there isn’t really that much of a game there. It’s mostly about solving a puzzle. But that is actually fine: it’s charming, cute, and quite a lot of fun, taking you on a bit of a roller coaster ride as things look hopeless for a while, then you get a lucky break and clear the barricades only to have a new wave of the undead coming and crushing you again. There are a lot of optional rules, most of which just add extra chaos, but some do add more genuine decision making to the mix, like hero abilities which need to be used at the most critical moment — but when is that? You can also ramp up the difficulty with special zombies or dial it back to make it easier for players who can only work with addition and subtraction. If you are interested, check out the City of Zombies website, where you can find out more and order a copy of the game. I’ve ordered one and we’re really looking forward to playing it some more. The game: City of Zombies (ThinkNoodle), 1 to ? players aged 8+. In the latest in my occasional series of posts on stuff found on Kickstarter, here’s City of Zombies, which takes this obsession the world seems to have with zombies right now to a whole new level of cute. Actually, the deal with this is that it is being pitched as an educational game, but it looks like it is educational in a similar way to, say, Sleeping Queens, where there is a fun game there and kids get to practice their maths skills as part of playing. This is great to see in a world where most producers of educational games fixate on some technical aspect of education like the Key Stage 1 history curriculum or, as we saw at UK Games Expo, on logic puzzles aimed at revision for the 11+ exam. Anyway, there’s zombies, there’s dice rolling, there’s really cute art (and optional less-cute art), and there’s what looks like simple but fun gameplay, so if that appeals, take a look and decide for yourself. As always, be careful on Kickstarter, but from my point of view I like the look of this and it’s good to see a project based close to where I live! Sometimes some toy comes along that is simultaneously too cool and too nerdy to be allowed to exist. This time it has to be Grime Dice, which are a set of non-transitive dice. What does that mean? Well, basically there are five dice, let’s call them A to E, and if you roll A and B together, A will have a higher result than B more often than not. Similarly B will roll higher than C, C than D, and D than E. But then E will roll higher than A most of the time. Huh? And then, if you roll two of each die, the sequence of winning reverses. Double huh? Apparently there’s a load of information about the maths of all this on the creator’s web site, which is linked from the shop page that I linked above, but unfortunately word has got out about this and half of the Internet wants to know more, so the poor guy’s website has exceeded its bandwidth limit and has been cut off by his ISP. Please try later. Oh, I love this stuff. And I’ve ordered a set. It’s OK, I didn’t want the spider. You can have it. Oh! The guard is a girl!